There’s just something about corn in the summertime. Corn on the cob always makes me think of barbecuing, basking in the sun, and carefree summer vibes. Even though I’m not a big fan of traditional BBQ food, I love the concept of BBQs — gathering together a group of friends on a hot summer evening to laugh, share stories, and most importantly, enjoy good food. I’ve been working sweet corn into a lot of my summer meals lately. 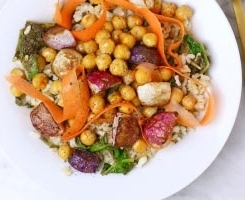 It is such a versatile addition to so many dishes, adding nice color, flavor and crunch. Corn is also considered a whole grain, providing heart-protecting, belly-filling fiber. 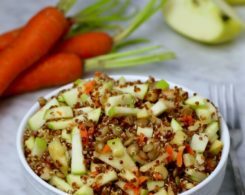 Despite the common misconception, it’s actually a very healthy carbohydrate option, containing a similar nutrition profile to whole wheat. 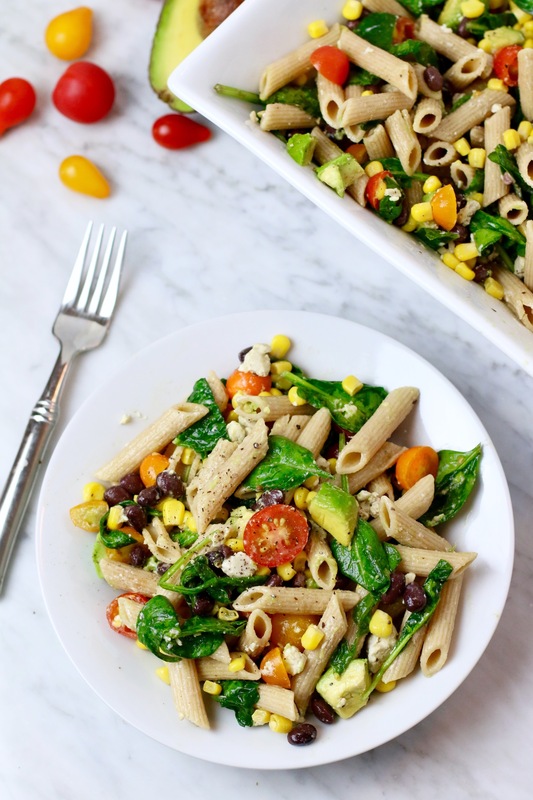 In the spirit of pot-lucking, I recently created this Sweet Corn Summer Pasta Salad using hearty whole grains, fresh veggies, and of course, my favorite summer staple. In the interest of speed, I used canned organic sweet yellow corn, but if you have the time, fresh grilled corn would take this salad to a whole other level. This dish makes an awesome side or a hearty main. 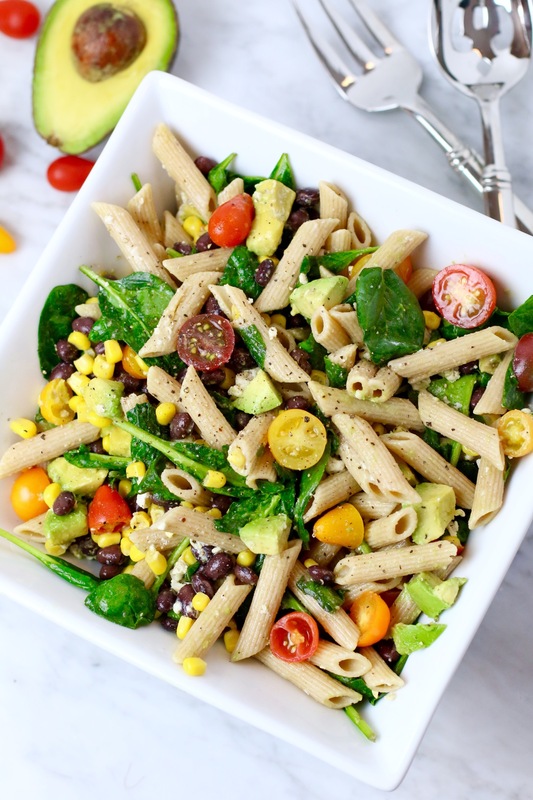 It’s packed with plant-based protein and fiber from the pasta and black beans, and heart-healthy fat from the extra virgin olive oil and avocado. 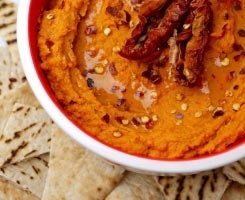 This dish is vegan, thanks to the amazing invention that is nut cheese, but it would also taste incredible with the addition of crumbled goat or feta cheese for my vegetarian/omnivorous friends. 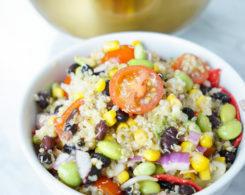 This easy summer salad is packed with plant-based protein from black beans, whole grains and nut cheese and bursting with flavor from tri-color cherry tomatoes and sweet corn. Cook pasta according to directions on package. Reserve boiling water. Place spinach leaves in a strainer. Pour boiling water over the leaves to wilt. Toss together pasta, spinach, corn, beans and tomatoes. In a small bowl, whisk together oil, vinegar and lemon juice. 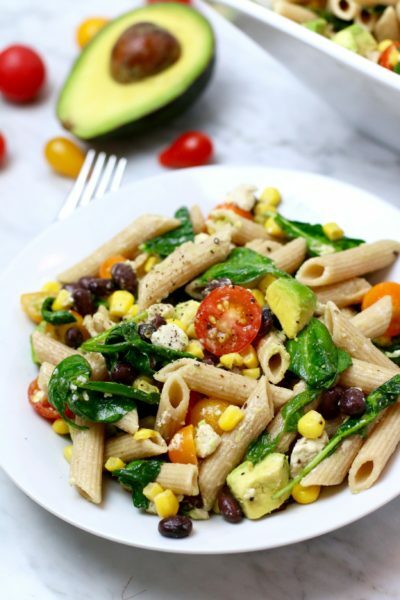 Toss pasta salad with the oil mixture. 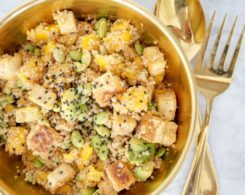 Fold in avocado cubes and crumbled cheese. Allow salad to cool in refrigerator for at least 30 minutes before serving. If you’re going the canned route with the sweet corn and black beans, look for cans that say “BPA free” to ensure you’re avoiding this common can coating that may cause health problems. Also, be sure to rinse your beans to get rid of added salt. 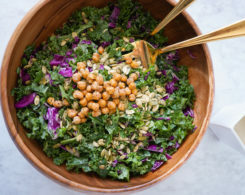 Salting the salad yourself is a better way to control flavor and sodium intake. Weigh in: What’s your favorite summer ingredient? Do you have any other great corn recipes I should try? Thanks! This corn bread looks phenomenal as well! Love the addition of beans. Thanks for sharing! Looks incredibly yunmy, Whitney. Going to give it a go! Thanks Amanda! Let me know what you think!! Salad looks delicious. Love fresh corn on the cob. A summer must.